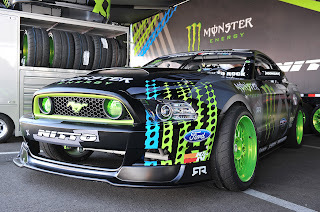 Earlier this year Falken Tire announced that they would be giving away a 2013 Ford Mustang customized by Formula Drift drivers Vaughn Gittin Jr. and Justin Pawlak. Seven months and over 100,000 entrants later, the lucky winner has finally taken delivery of the car. The one-off Mustang featured a custom Hot Lime Green, selected specifically by Justin Pawlak and applied by Creations ‘n Chrome, as well as HRE wheels, a Ford Racing supercharger kit producing 624 horsepower and a Ford Racing adjustable suspension system. This 2013 Ford Mustang Convertible was on display at the TruFiber booth at SEMA in Las Vegas, and not since Vaughn Gittin Jr’s RTR-C Mustang have we seen so much carbon fiber. The car was fitted with just about every carbon fiber part offered by the company, from the front splitter to the hood to the rear diffuser. Even the convertible top cover was made from carbon fiber. Earlier this year Ford and SEMA announced that they would be teaming up on Mustang project completely designed and built by women. Three concepts were initially created, with the winning design, seen here, being chosen via an online poll. Nicknamed “High Gear”, this Mustang was designed by Jennifer Seely of Ford and is inspired by jewelry, couture clothing and architecture. 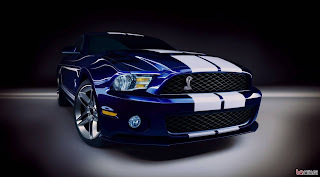 We’ve already shown you plenty of photos and videos of the 2012 Shelby 1000, which made its debut at the New York Auto Show earlier this year, but with the supercharged V8 producing up to 1,100 horsepower it’s definitely a car that deserves a second look. Or third. Or fourth.